They only eat carrion, you know. 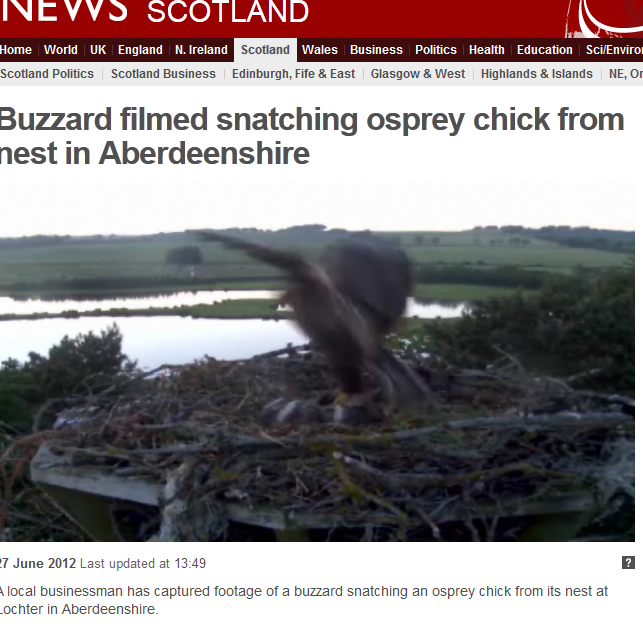 Full article, video and quote from the RSPB (who are turning a blind eye on the incident) can be found by following this link to the BBC website. I like ospreys, but I must admit that there is some grim humour here which almost borders on a sense of justice. Passing it off as an isolated incident seems optimistic, since that was probably the easiest meal that buzzard has ever had. He’ll be back, but the chances are that nobody will be filming next time. 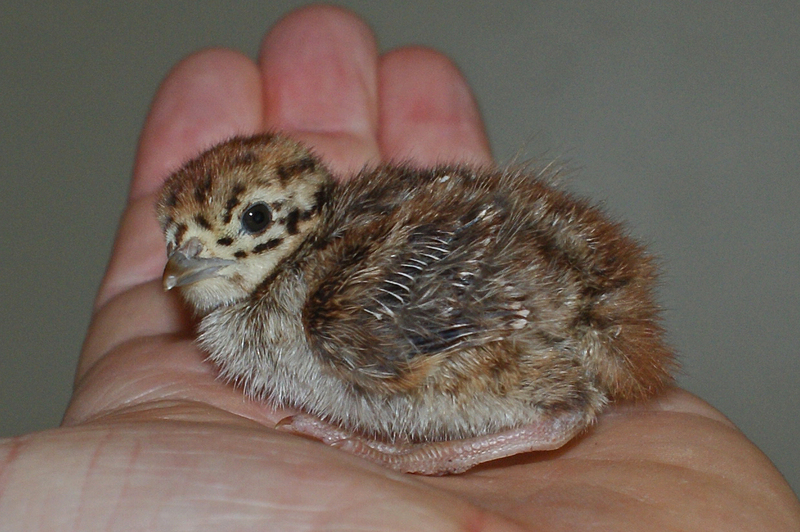 After two weeks, I now have only one grey partridge chick. The bacterial infection killed the second chick on Tuesday, so now I’m stuck with a single chick from the first batch. It’s being brooded with some quail, so it’s not on it’s own but it’s still pretty disappointing. You now can’t tell which one was rejected – a lesson learnt. Inevitably, the first batch of chicks to come off under the first broody of the year did so during one of the wildest and wettest weekends I can remember. 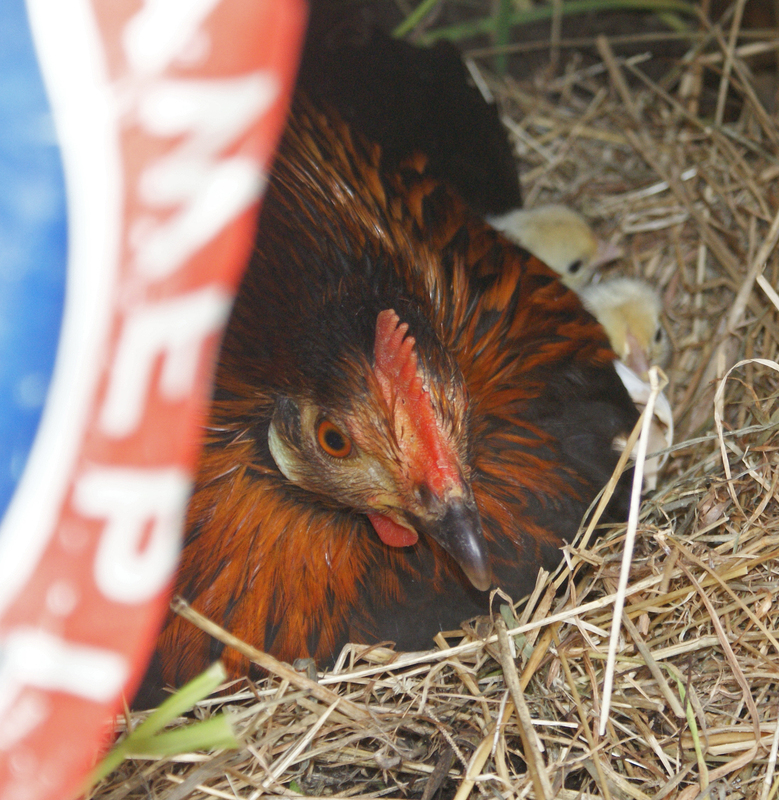 The rain was thrashing down yesterday morning when it was revealed that the mixed clutch of pekins and silver sebrights had begun to hatch. For reasons best known to herself, the black rock mongrel mother rejected one of the sebright chicks, and when we found it lying on its own, pressed up against the door of the broody house, it looked like it was dead. When we picked it up, it made some tiny movements, and we rushed it off under a heat bulb. Within a couple of hours, it had staged a complete recovery. The next problem was how to get the chick back under its mother. This is something that I’m going to have to learn over the next few years of rearing partridges and black grouse, and, with the greatest respect to my girlfriend’s beloved but totally useless sebrights, I was quite glad that I was learning on something less important than a gamebird. I opened the coop and placed the fluffy chick infront of its mother this morning. Immediately, she began to peck hell’s bells out of it. It was not going to be as straightforward as I had thought. Retreiving the chick, I held it in the palm of my hand and curled my fingers around it. I then turned my hand upside down and reached down towards the broody. She pecked me quite dramatically, but stood up just long enough for me to drop the chick in amongst its siblings. She was so angry with my hand that she hadn’t seen the transaction, and the chick had used me as a human shield on its way back into the nest. When I went back to see them this afternoon, I couldn’t see which one it was. There were no obvious casualties, so it seems like the re-adoption was a success. All this poultry business is quite fun, but I can’t help reminding myself that it’s just training for next year when I’ll do it properly with gamebirds. Even the little I’ve done so far gives me a whole new respect for the old keepers, who must have known an astonishing amount about the birds they worked with. 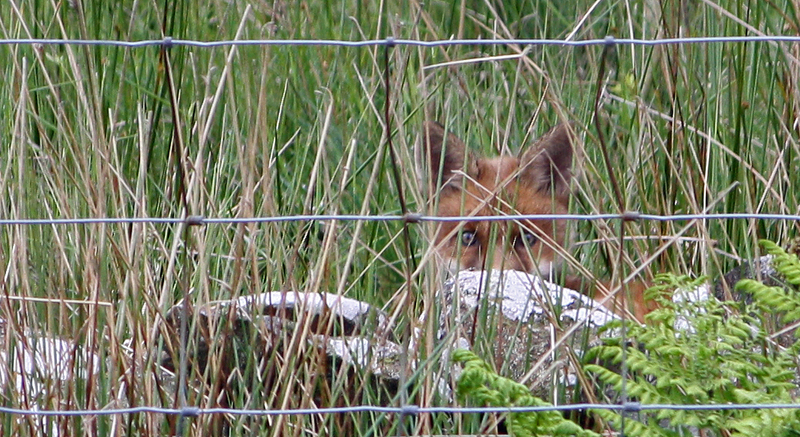 Worth mentioning that my insanely frustrating game of cat and mouse with the local fox cubs continues. They appear frequently enough for me to be at constant red alert, but infrequently enough for me to have lost my concentration when they do appear. Despite the fact that I am always carrying a shotgun at the moment, I still seem to find myself unarmed just at the crucial point when that dark smear in the moss resolves into a face with blue eyes and pointed ears. In the meantime, the only thing I have been able to accurately point is my camera – I hope that this picture (above) will serve as a permanent reminder to me that, while photographs are all very well, a shotgun cartridge is better. I must admit that, as soon as I had taken this picture and the cub had vanished into the rushes, I swore heartily. Twenty three days after the game crop was drilled, there has been some serious progress. 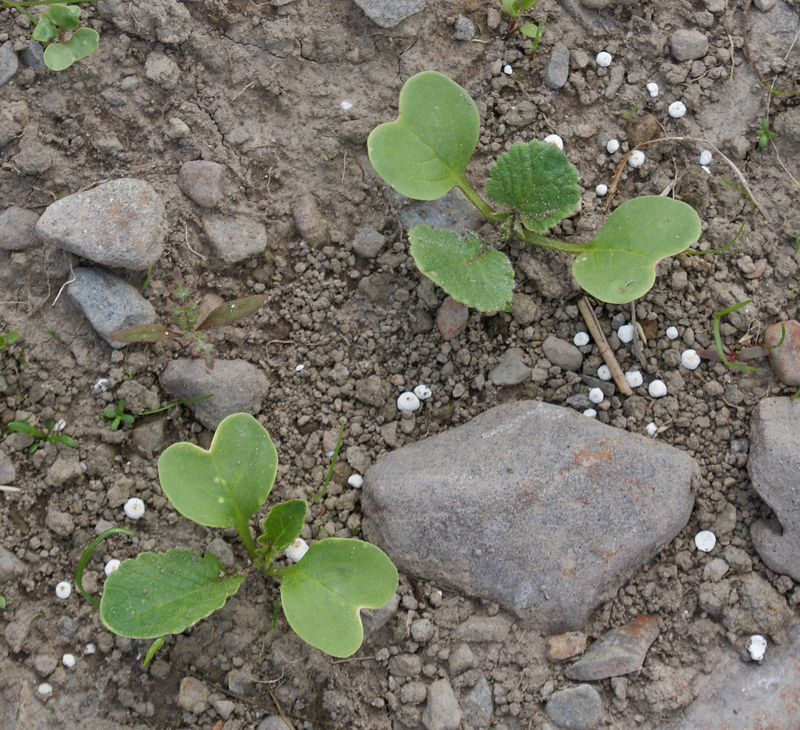 The field is now covered with rapidly expanding little plants, and despite the fact that I still can’t tell a turnip from a radish, it’s very exciting indeed. It’s interesting that the local wildlife has shown such little interest in the field. Touching wood as I type, I haven’t seen any pigeons or crows on the field ever since I put Mr. Lightbody the scarecrow up. I know he’s great, but he’s not so good as to have put all the birds off altogether for three weeks. I suppose it says a great deal about the poor quality of habitat on the hill until now. It seems like the Chayne is in such a sorry state that it can’t even support much in the way of vermin, let alone gamebirds. Asking the local game farmer for some advice on the mystery madness which has knocked my grey partridge chick off its feet, I discovered some interesting information. I was also generously given several trays of damaged, misshapen and unusual pheasant eggs which failed the entry assessment to the incubator. 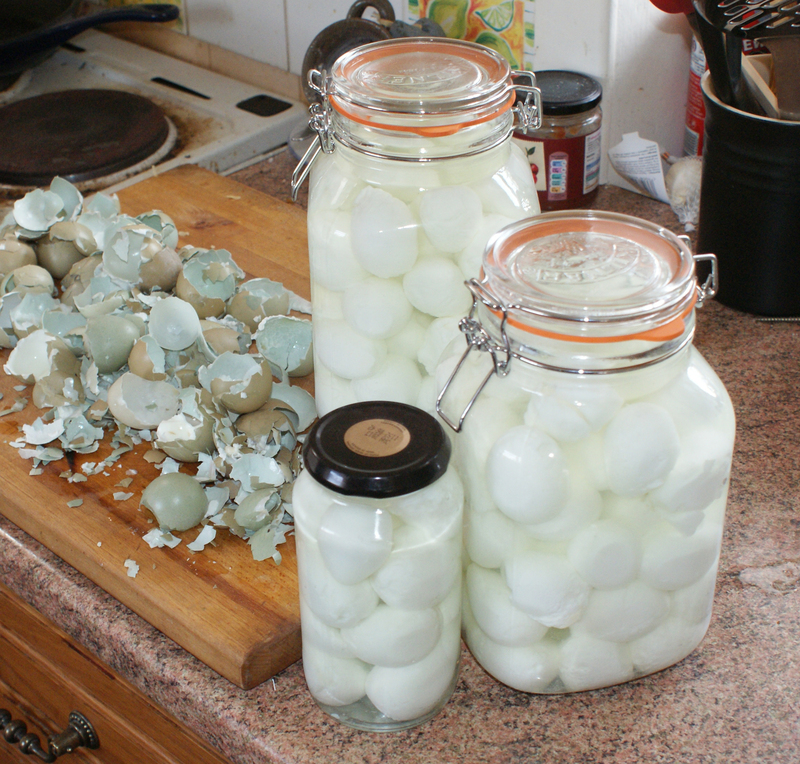 Two hours later, I now have over one hundred and fifty pickled pheasant eggs. I love pickled eggs, and a big part of me is starting to think that, given my consistent bad luck with hatching off gamebirds this summer, I might be better suited to a life in the catering trade. 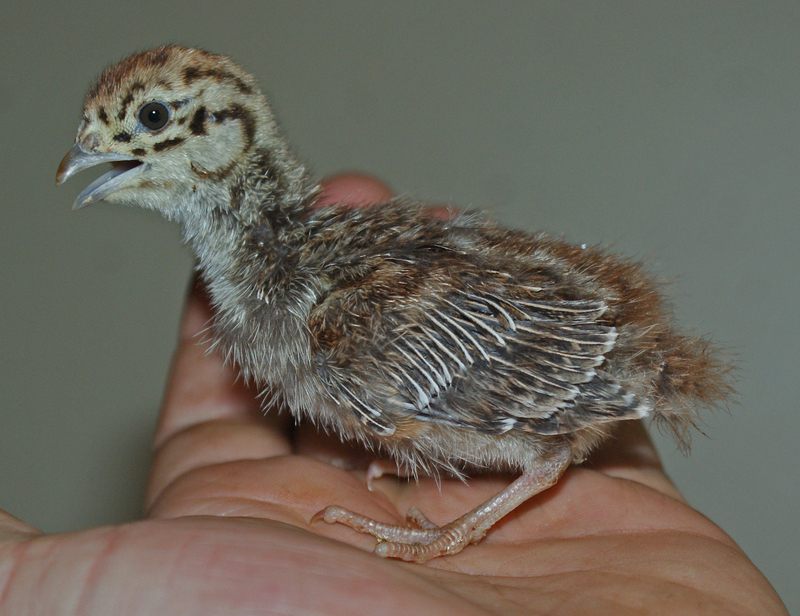 Just wanted to post this picture of the same partridge chick I photographed a week ago, when it was a day-old. I’d like to photograph the same chick every week until it gets its adult plumage, mainly because I don’t know much about grey partridges and it would be interesting to document it. He started to grow wing feathers on Thursday last week, and now has quite a respectable spread of down-tipped pins along the length of each wing. In the meantime, this chick’s partner has contracted some kind of bacterial infection over the past 24 hours. I noticed that he was hanging his head a bit last night and wouldn’t stand up straight. This morning, the only thing he can do is tuck his head under his bum and scrabble backwards. I’ve seen something similar before, where illness seems to bring about total malcoordination and apparent madness, and I only hope that the antibiotics I put in the water system will bring him round and stop everything else going the same way. Fingers crossed, although I must admit that I don’t have high hopes for the other partridge.